With the help of the built-in panel, you can charge you mobile phone and other equipment. 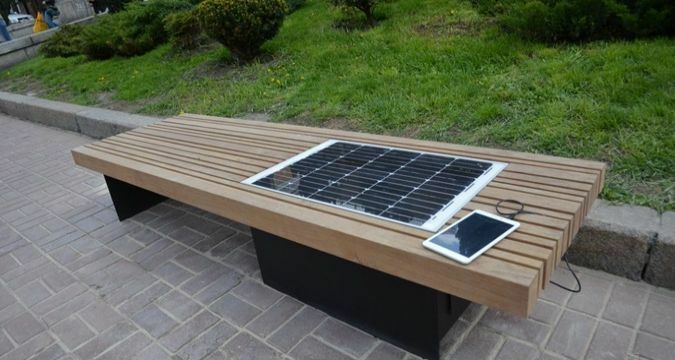 The first bench with built-in solar panel has been installed near the metro station on Khreshchatyk Street in Kyiv. Using the USB-ports of built-in solar panel one will be able to charge the mobile phone and other equipment, according to UNIAN. “The benches will be available under the Registered Investment program, so you can give it to the city or set it near your office and have a plaque bearing your name installed on the bench. The idea is foreign, the initiative is ours, the design from 2B Group and hardware is Ukrainian-produced! The preliminary cost of this bench, including its installation and plaque, is UAH 15 thousand,” said Denis Pivnev, Director of the Kyiv Center for Development of Environment. He also noted that this bench is the first in Kyiv, but if the idea takes hold, it will not be the last one. It was reported earlier that the first five "smart" transportation stations getting power from solar panels and having Wi-Fi as well as built-in USB for mobile phones were installed in Kyiv in October last year. In April, the city authorities have opened the sixth station, promising to install 50 more by the end of the year.